We had a shortlist of names picked out in the early days of finding out we were expecting, narrowing it down pretty quickly between the two of us. But as soon as we came across the name Nova, we knew it was the one. Jason and I have always had a bit of a celestial theme in our relationship, from the constellation tattoos we share, to our frequent “love you to the moon and back” promises. 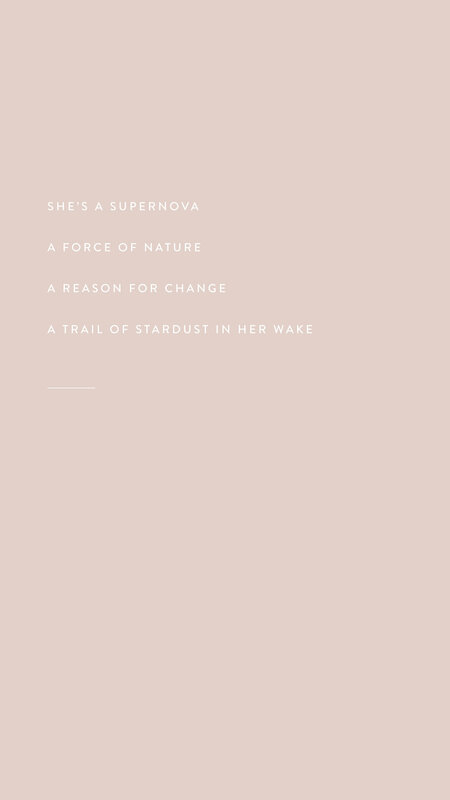 Our wedding included nods to magical nights and twinkling stars, and so without knowing we were looking for a name that would follow suit, Nova hit the mark right on, with it’s allusion to the brilliant, exploding supernova star. We had wanted a name that was different but not too odd, something simple and beautiful that would stand out, just as we know she will. And we found that in the name Nova. For her middle name, I wanted something that would serve as a tribute to my grandparents who are no longer with us, and so Rose came from my early childhood memories of time spent at their house, where the gardens were filled with rose bushes and my love of flowers stems from. It felt like the perfect match to her first name, complementing but not overpowering. Since we decided on Nova Rose pretty early on, I found myself drawn to anything that tied in to either name, which quickly manifested into a curated selection of tiny, wearable trinkets. I’ve always been partial to delicate layered jewellery, so when given an excuse to start wearing with such a special purpose? I’ll take it. I envisioned a gold rose stem that I must have seen at some point, and after spending way too long hunting for one online, came across this inexpensive little beauty that I’ve been wearing for months now. The second rose necklace, a small etched gold coin, came from Wolf Circus, a Canadian brand I’ve loved for years but had yet to purchase a piece from. When I saw the rose coin, I knew I had found the one. So I’ve been wearing those two layered since early in my pregnancy, and they’ve served as a special tie to my daughter throughout. A visual, touchable reminder of this newfound love. How perfect is that? It lives saved on my phone now, and I wear the twinkling Nova earrings every day thanks to bluboho, just subtle enough to go with absolutely everything, and the perfect little reminder of what she means to me. And for the next addition to my collection, I have my eyes on the matching necklace (surprise, surprise), as well as the Little Crescent Necklace, which represents new beginnings and also feels perfectly fitting for this new chapter.